Buddy Hield (193-G-93, college: Oklahoma) scored 22 points on 9-of-11 shooting, including 4 of 4 from 3-point range, to lead seven Sacramento players in double figures. Justin Jackson (203-F-95, college: N.Carolina) made four 3-pointers and finished with 18 points, and Harry Giles III (208-F-98, college: Duke) III scored 16. Josh Childress (203-F/G-83, college: Stanford), who played eight seasons in the NBA, led Maccabi Haifa with 18 points. Kosta Koufos, Bogdan Bogdanovic and Iman Shumpert did not play. Frank Mason III (180-PG-94, college: Kansas) scored 13 points with eight assists and five steals. Willie Cauley-Stein (213-F-93, college: Kentucky) had 13 points, eight rebounds, seven assists and three steals. Kennedy Meeks (208-F-95, college: N.Carolina) had 17 points, nine rebounds, four assists and two steals. Sacramento (2-2) plays host to Utah on Thursday. San Antonio Spurs held off Denver Nuggets to even the series at 3-3. Spurs looked well-organized offensively handing out 25 assists. Great defensive blocking was one of the keys in this match when Spurs made 7 blocks. 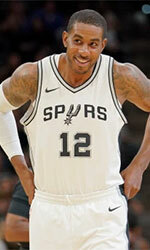 Power forward LaMarcus Aldridge (211-85, college: Texas) had a double-double by scoring 26 points, 10 rebounds and 5 assists to lead the charge for the winners and swingman DeMar DeRozan (201-89, college: USC) chipped in 25 points, 7 rebounds and 7 assists during the contest. The best for the losing side was Serbian center Nikola Jokic (209-95, agency: BeoBasket) with a double-double by scoring 43 points (!!! ), 12 rebounds and 9 assists and Canadian swingman Jamal Murray (198-97, college: Kentucky) scored 16 points and 6 assists. Both teams had four players each who scored in double figures. Both coaches used bench players which allowed the starters a little rest for the next games. LA Clippers outgunned Golden State Warriors to remain alive in the series. The series will now move to Los Angeles with Golden State up 3-2. Clippers made 24-of-26 charity shots (92.3 percent) during the game. Their players were unselfish on offense dishing 29 assists. 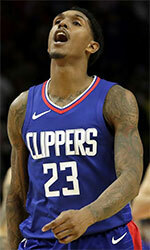 Lou Williams (185-86) nailed a double-double by scoring 33 points (!!!) and 10 assists for the winning side and point guard Patrick Beverley (185-88, college: Arkansas) accounted for 17 points, 14 rebounds and 4 assists. Five Clippers players scored in double figures. Kevin Durant (206-88, college: Texas) came up with 45 points (!!! ), 6 rebounds and 6 assists (was perfect 12-for-12 from the free throw line !!!) and point guard Stephen Curry (190-88, college: Davidson) added 24 points and 4 assists respectively for Warriors in the defeat. Houston outscored Utah at home court to win the series 4-1. Great defensive blocking was one of the keys in this match when Rockets made 12 blocks. The best player for the winners was James Harden (196-89, college: ASU) who scored 26 points, 6 rebounds, 6 assists and 4 blocks. Point guard Chris Paul (183-85, college: Wake Forest) chipped in 15 points, 8 rebounds and 5 assists. Rockets' coach used a ten-player rotation and allowed the starting five to get some rest. Spanish guard Ricky Rubio (193-90) produced a double-double by scoring 17 points and 11 assists and Australian Joe Ingles (203-87) added 11 points, 6 rebounds and 9 assists respectively for the hosts. Both teams had four players each who scored in double figures. Utah rolled past Houston to open win count in the series. Jazz dominated down low during the game scoring 52 of its points in the paint compared to Rockets' 22 and made 22-of-26 free shots (84.6 percent) during the game. They outrebounded Rockets 52-35 including 16 on the offensive glass. Jazz looked well-organized offensively handing out 24 assists. Great defensive blocking was one of the keys in this match when Jazz made 7 blocks. Quite impressive performance for guard Donovan Mitchell (190-96, college: Louisville) who helped to win the game recording 31 points, 7 rebounds and 4 assists. Spanish guard Ricky Rubio (193-90) contributed with a double-double by scoring 18 points and 11 assists for the winners. Point guard Chris Paul (183-85, college: Wake Forest) replied with 23 points, 8 rebounds, 7 assists and 5 steals and James Harden (196-89, college: ASU) added 30 points and 4 assists (made all of his eight free throws) in the effort for Rockets. Both teams had four players each who scored in double figures. Both coaches allowed to play bench players saving starting five for next games. Milwaukee stormed past Detroit to sweep the series. Bucks made 31-of-41 free shots (75.6 percent) during the game, while Pistons only scored nine points from the stripe. They outrebounded Pistons 54-36 including a 44-26 advantage in defensive rebounds. Bucks looked well-organized offensively handing out 27 assists. Great defensive blocking was one of the keys in this match when Bucks made 10 blocks. Pistons were plagued by 31 personal fouls down the stretch. Quite impressive performance for Greek-Nigerian swingman Giannis Antetokounmpo (211-94, agency: Octagon Europe) who helped to win the game recording 41 points (!!! ), 9 rebounds and 4 blocks. Guard Sterling Brown (198-95, college: SMU) contributed with 9 points, 13 rebounds and 6 assists for the winners. Point guard Reggie Jackson (190-90, college: Boston Coll.) replied with 26 points and 7 assists and forward Blake Griffin (208-89, college: Oklahoma) added 22 points, 5 rebounds and 6 assists in the effort for Pistons. Four Bucks and five Pistons players scored in double figures. Since the result was very predictable, it gave the chance for the coaches to test many bench players and allowed the starting five to get some rest.